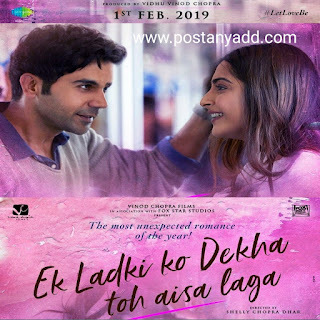 Many films have already been made on extremely sensitive subject homosexuality, and now Rajkumar Rao, Sonam Kapoor and Anil Kapor saw a girl in the movie (Ek Ladki ko Dekha to Aisa Laga) is also based on this issue. The movie's Subject is being released in the current phase, quite different from the movies ... the film has been released. writer and director Sahil Mirza (Rajkumar Rao) is loved by seeing sweetie (Sonam Kapoor). So, with the excuse of drama and talent hunt with Chhatro (Juhi Chawla), she reaches the village Moga of Sweeti, where Sweetie lives with her father Balbir Chaudhary (Anil Kapoor), BG (Madhumlati Kapoor), Veerji (Abhishek Dhahan). Like a Sahil, Hmmm wraps his love with sweetie, but he is surprised to hear the reply of Sweetie. Now, what is that secret, how does Sahil react? After knowing this state of sweets, how do Sahil accept or not? You have to see this movie to know the answers to all these questions. And for that you have to come to the theaters. It was then the story of the movie is now seen on Ek Ladki Ko Dekha To Aisa Laga movie review. Ek Ladki Ko Dekha To Aisa Laga Talk about Movie Review, first thing comes to the subject of the story. And on this scale, the movie has come true. The subject of the film is quite different and effective, which will force viewers to think for a minute. The story of the film is based on Punjabi characters, hence also it has been successful in abandoning more impact. There is no shortage of direction in the direction of the film. Even though First Half is broken, but the film is very strong in second half. Every act has done 100 per cent, every character has given it 100 per cent. Everybody plays a lot in his role, whether it is Sonam Kapoor in the role of Sweetie or else in the role of Dalbir Singh, Anil Kapoor. The role of Anil Kapoor and Rajkumar Rao in the film is also very much appreciated. Juhi Chawla and Anil Kapoor's duo have seen together after a long time and are very interested in the film. Talk about the songs of the movie, people are enjoying the songs. Overall, movie review is worth mentioning then the movie is worth watching.